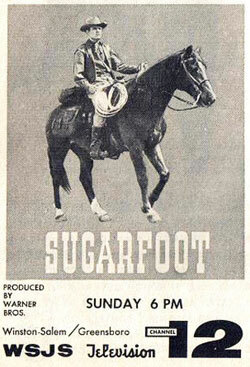 Will Hutchins reminisces about William Smith, Sugarfoot. Howdy! Wanna talk football? Slingin’ Sammy Baugh, “King of the Texas Rangers”. Golf? Swingin’ Sammy Snead. Poetry? The two Williams, Shakespeare and Smith! In high school I won an all-city acting award for a scene in Shakespeare’s “Winter’s Tale”. I played Autolycus the Pickpocket. I still have the plaque, inscribed in Latin. Translation: To be rather than to seem. In college I played Demetrius in The Bard’s “A Midsummer Night’s Dream”. I was a method actor. During a rehearsal I fell asleep on stage. My legs were so skinny that I attached suspenders to my tights to pull up the slack. Wanna talk flick fests o’ the west? Mr. and Mrs. Smith! William and Joanne! Yesireebob! Invite ‘em and let the good times RRRoll! We have his book, THE POETIC WORKS OF WILLIAM SMITH. He inscribed it “To Babs and Will. Love, Bill Smith.” Babs and I are computer challenged. Hence, we identify mightily with Bill’s poem “Computer Assault”. Quote: “Computer Assault on man’s love of reading, writing, debating, and searching for knowledge, No longer do we share our thoughts, our lives have become an electronic college. Now it seems life’s goal is to be an isolated, unfeeling dot com geek.” His reckonings on cowboys and Indians, love and country, family-friends-flicks, the onslaught of time, are beautifully spot-on. I heartily commend Bill’s book to you. I now have all 69 “Sugarfeet” episodes, in good condition. Just watched a semi-polished gem, “The Wild Bunch: 1961”, a rip-off of “The Blackboard Jungle”. I play a temp teacher (ala Glenn Ford) in a wild and woolly country high school. Troy Donahue plays a truant teenage tyrant (like Vic Morrow). I attempt to quell his raging hormones with a smile, tact, logic. He responds with a sneer, a curse, a haymaker to my cabeza. He beats the sugar outta me. After all, he was a heartthrob back then. Later, I craftily crumble him in a sneak attack. After all, it was my show. We featured EOP (Equal opportunity punch-ups). At last, Troy sees the light, and we join forces in ridding the town of evil Ray Danton. The name of the teacher I replace? A Mr. Peckinpah! Hmmmm. In ‘69 Sam Peckinpah directed the epic western “The Wild Bunch”. Egads! Gadzooks! Zounds! Ods bodkins! Give me back my “Beetle Bailey”! The NEW YORK DAILY NEWS has disappeared him. I’m bereft. I lost a good friend of over 50 years. Every a-yawn I go outside for the papers. Blizzards? I bring a shovel. First, I work the puzzles, to keep Alz. Hiemer from knockin’ on the door. Then, the funnies, not so funny sans Pvt. Bailey, stationed at Camp Swampy with its denizens: General Halftrack, the gorgeous Ms. Buxley, Sgt. Snorkel and his uniformed dog Otto, Zero. Bob Denver would have been nifty as The Beetle. We still have “Peanuts” reruns, “Blondeee!” (I’m the world’s only living Dagwood), “Pickles”. Ol’ man Earl Pickles and his crotchety ways—porchside, sittin’ way back on his rocker, legs up on the railing, a’whittlin’, a’whistlin’, a’feedin’ the pigeons. He dons a Stetson and writes cowboy poems. “Every cowboy has a poem about his favorite old horse,” he says. His buddy Clyde says, “You don’t have a horse.” Earl says, “That’s ok, every cowboy poet lies…to write cowboy poetry you’ve got to get in the right mood,” and he picks up some sacks. Clyde says, “What’s the manure for?” “Inspiration,” says Earl. His wife Opal says, “You’re just fooling yourself. Face it, you’re not a cowboy.” Earl reads his poem, ending, “I haven’t spent years in a saddle, but if you were to look, you’d find, from years and years in a La-Z-Boy, I’ve got a cast-iron behind.” Heh, heh—reminds me of someone I know, quite well. World’s most famous intro, intoned by the great Fred Foy who recently passed on through. What a gentleman. What a thrill working with him at old time radio conventions. His scripts looked as if baby chicks had walked across them. His unique code for getting the most impact out of his line readings. Scientists say that every sound, every word spoken, since time began, live, somewhere out thar in the cosmos. From out of the past and into the future, William Tell and Fred Foy will never die.